Have you ever had that canned Cream of Mushroom Soup? Kind of bland and goopy, right? It might just be me, but I absolutely cannot stand canned cream of mushroom soup – so beige and unnatural. But have you ever had HOMEMADE Cream of Mushroom Soup? With chunks of real mushroom floating in a creamy herbed base? There’s a world of taste difference between canned and homemade, not to mention there are no nasty preservatives in homemade soup. But it’s so hard to make homemade soup you say? Pffft! 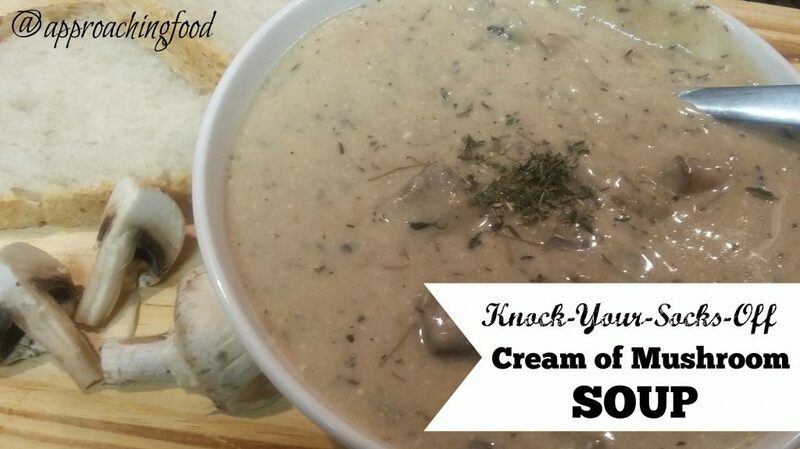 Try this recipe for Knock Your Socks Off Cream of Mushroom Soup; it’s surprisingly quick and easy and OMG it’s delicious! I can easily eat bowlfuls of this soup just because it’s yummy; it’s really just a bonus that it’s preservative-free too. I love that I can feel good knowing exactly what I’m putting into my body, while happily stuffing my face just cause the food is yum. 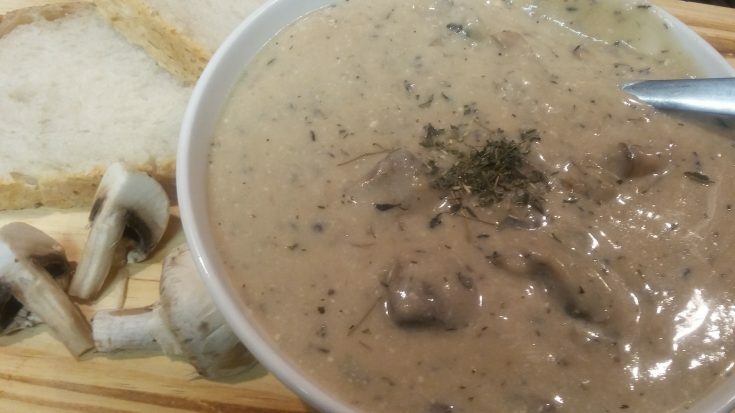 Plus, any recipe you have that calls for canned Cream of Mushroom soup, replace it with this one – it’ll make the recipe that much more delicious, not to mention healthier too! Want to make some? Lets! This fragrant mushrooms soup is full of chunks of real mushrooms, all in a herbed and creamy base. Wash the mushrooms and chop or slice them. (I like to quarter them.) Mince the garlic. Melt the butter and fry the garlic and mushrooms until they’re tinged golden-brown and have shrunken about 1/3 in size. Stir in the flour and fry for two minutes. The mixture will clump up and that’s ok.
Stir in the milk. Again, the mixture will be all clumpy and that’s ok.
Add in the water, stock, thyme, and pepper, and stir until the mixture is smooth. Let cool slightly and stir in the yoghurt. Serve, and revel in the fresh and creamy taste! You can use liquid stock instead of a square of stock plus two cups of water, as long as the liquid is equal to two cups. You can even use homemade vegetable stock -- in fact, I recommend it! Since I was trying to make a healthier version of Cream of Mushroom soup, I used yoghurt instead of cream. Yoghurt will end up the slightest bit grainy in the soup, especially if you stir it into very hot soup. I personally do not care, as I love the health benefits of yoghurt (probiotics, get in my gut! ), but if you are super keen to photograph your soup, you could replace the yoghurt with milk and get a smoother final look. Eh. You do you, boo! Let us know in the comments how you think this preservative-free Cream of Mushroom Soup stacks up compared to the canned version! And share it on social media, so we can get a preservative-free revolution going on! This entry was posted in Uncategorized on March 23, 2019 by Margaret. Definitely unsweetened! I’ve subbed cashew milk in many recipes – it’s inherently creamy so it’s a great alternative to milk,cream,yoghurt etc. I’ll let you know how it is in this soup. So….it was delicious! I made more of a cashew cream rather than milk and I didn’t add flour (didn’t have any!). So it became a delicious vegan, gluten free mushroom soup! Thanks so much for the inspiration! P.S. I added a little oregano and rosemary too.